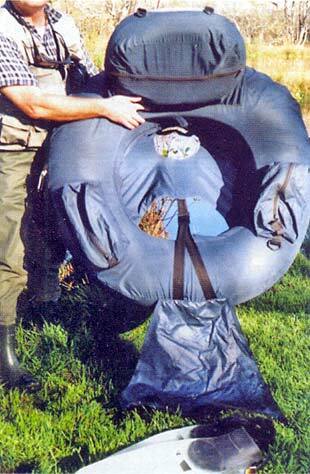 Float tubes have been used with success by European and American still water anglers. Designed to provide anglers access to overgrown lake margins and out of reach weed beds, they are used more commonly on North Island waters than here on the Mainland. We see the doughnut shape of the main tube with the webbing seat area. The black strap is adjustable to allow for comfort and sitting height in the water. The material on the ground in front of the tube is a splashguard, also used to measure fish length, that clips into place before you set off. I add an air ﬁlled wine bag to the zippered backrest for added buoyancy. It’s also a good place to keep your sandwiches. Speaking to the blokes in some of Canterbury’s tackle stores, l asked if they were available and why they were not often seen on our high country lakes. I was told that they could be obtained within just a couple of days. I was also told by one retailer about an experience he had when fishing with a tube on Lake Sarah. It seems that he was ﬁshing the fringes when he felt something against his legs, looked down, and saw the first of a bunch of eels taking a very close look at his neither regions. So he quickly pushed off back to land! Float tubes vary somewhat in design from nylon coated truck tubes with “mini” inner tubes as a backrest, to a sophisticated moulded seat chamber built in. Inﬂation is easily achieved using a small air pump, which can be purchased for about twenty dollars and works from a car battery or car cigarette lighter. Showing how to enter the water whilst wearing ﬂippers; very carefully watch your balance, and make sure your rod is within easy reach when you are safely in. Always make sure you have the right amount of kit stowed away in the pockets or else you will have to go back for it. 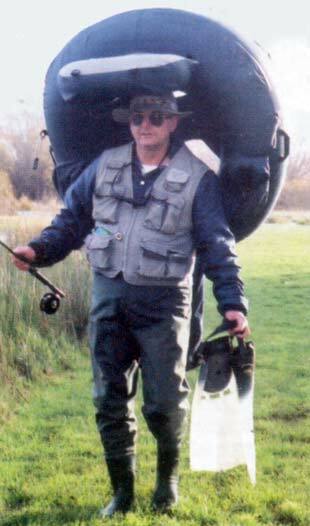 The angler uses chest waders (especially in colder waters) and ﬂippers. 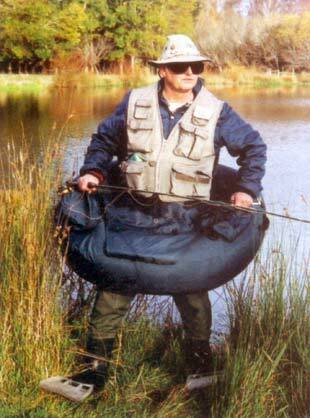 Fishing gear is stored in zippered pockets around the large tube, or inside the inner space of the backrest. l personally keep my sandwich lunches in that area, and perhaps a cold can on a hot summer’s day. To move towards the weed beds just point your back in the desired direction and kick your flipper-clad feet, trolling or casting as you go. Turning to safety issues now, it is recommended that ﬂoat tubes only be used on smaller still waters and that a lifejacket is worn by the angler. Beware of weather changes, especially our nor-westers, which could make it hard to return to shore. Carrying the tube to and from the lake. Your head ﬁts into the centre of the backrest for comfort, and you could easily walk for a couple of kilometres like this. Certainly, do not use on rivers unless you have a death wish. 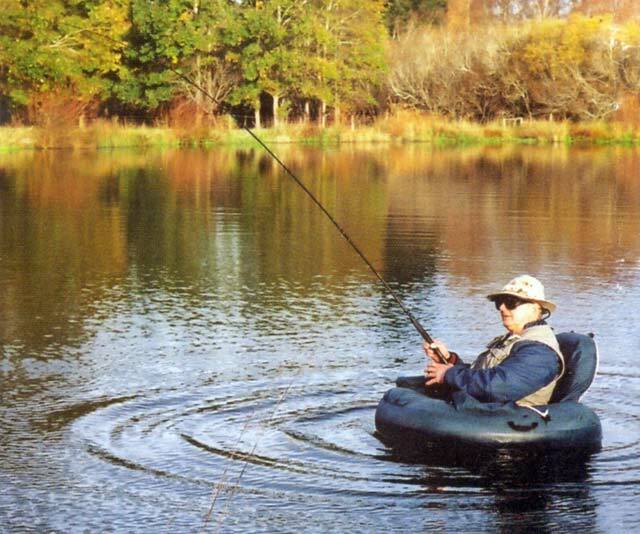 Don’t over inﬂate, and check regulations with your licence guide or with the local branch of Fish & Game New Zealand to make sure you are permitted to use a ﬂoat tube on your target water. I can think of nothing more satisfying than using a float tube on a still summer’s day, stalking the weed beds and reed margins for fish.